(Young Adult) Sixteen-year-old Starr straddles two worlds, the poor black neighborhood where her father runs the local grocery and her mother works at the clinic, and the private urban school she attends. She successfully keeps these two separate until she witnesses the fatal shooting of her friend Khalil. Because Khalil was killed by a police officer, Starr feels pressure from both her worlds to respond in different ways. 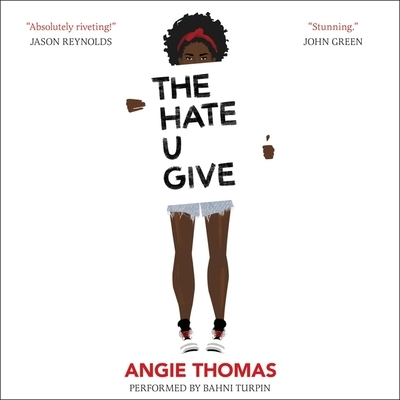 Angie Thomas has chosen a timely topic for her debut novel and handles the subject with intelligence and honesty. Soon afterward, his death is a national headline. Some are calling him a thug, maybe even a drug dealer and a gangbanger. Protesters are taking to the streets in Khalil's name. Some cops and the local drug lord try to intimidate Starr and her family. What everyone wants to know is: what really went down that night? And the only person alive who can answer that is Starr. But what Starr does--or does not--say could upend her community. It could also endanger her life. And don't miss On the Come Up, Angie Thomas's powerful follow-up to The Hate U Give.